Thanks to you, we had a great campaign. The result so far exceeds our initial expectations and it's really been a great ride. You can't imagine how excited we are that we're going to be able to make our game so much better, and the motivation we took with us from this campaign is going to be worth a lot more gameplay than mere money can buy. As we enter the last 48 hours of Divinity: Original Sin's Kickstarter we're going to give everything we've got to further spread the word and who knows, perhaps we'll even manage to reach our final stretch goal! If we include Paypal in the total amount, the 700K goal goal is reached already and that means that the music of our brilliant composer, Kirill Pokrovsky, will now be performed by a symphonic orchestra! To celebrate this goal, ALL our Kickstarter backers will receive a free digital copy of a very unique Divinity audio CD with remastered and remixed music from "Beyond Divinity" and "Divine Divinity". In supporting Divinity: Original Sin, you're not just supporting one RPG, but several RPGs that we are planning to make. Here's the full story of what we at Larian Studios are up to. You'll be surprised at some of the footage you'll see, in a pleasant nostalgic way. Anybody moderately interested in making his own RPG adventure should watch this video! Congratulations to Vincent & Liesbeth!!! Vincent, a wonderful level designer and a fantastic actor, can add a beautiful daughter to his list of achievements! Congratulations from all of us at Larian. You are entitled to smoke one cigar, and then you need to quit smoking!!! The next Fanday will be in Gent, Belgium on friday August 9th 2013. Available in S, M, L, XL and XXLAvailable in S, M, L, XL and XXL. Weresheep models are also available. Female T-Shirts now also available!!! We received support from a number of other developers here on Kickstarter throughout this campaign and we'd like to thank them all for their support. We suspect you know about them already, but if you don't, be sure to check them out. Pretty cool stuff and for them, it's the same story as for us - the more support you give them, the better their games will be. The better the games, the more successful the developers. The more successful the developers, the stronger the walls of their independence. The stronger their independence, the more gameplay innovation you can expect. This is a very worthwhile cause if you like games, so spread the word! Battle worlds Kronos, made by King Art games - an awesome new turn-based strategy game. If you're into these games, get this. They still have 3 days to go and some cool stretch goals to achieve. Torment, made by inXile - the spiritual successor to Planescape Torment with an all-star team. It's going to be great! Even if their campaign is over, you can still fund them on Paypal. Project Eternity by Obsidian - an isometric RPG of the type we like. We have quite a few Obsidian fans in the office so backing this was a no-brainer. Their campaign is over, but you can still fund them via Paypal. Camelot Unchained - a realm vs realm MMO, set in a post-apocalyptic world with plenty of interesting ideas. Camelot Unchained has consistently been above us on kicktraq during our campaign and so there hasn't been a day when we weren't thinking of them ;) The devs put a truckload of their own money in their game, so you can rest assured sure that they believe strongly in their concept. That is always a good sign. They still need some funding to reach their goal, so do check them out. Well, I hope you will decide to do remake of original game at some point. I am really interested. Very happy to see you've got the companion stretch goal (if you include Paypal donations, as it stands at the moment) and would really like to see the night/day cycle stretch goal being reached. I think that adds a real sense of believability to a place, and it'll also cool to sneak around at night if you're playing as a thief-type character as I probably will be. Looking forward to the live play on the 26th too. Just backed the project, I cant wait. 3 things: If you are going to "were" sheep please do other mammals as well. You're managing your campaign very well, congrats! "Raze was correct - you need a physical tier for physical add-ons, but we did say that we were going to look in to the shipping costs for T-shirts so they can be added as add-ons. As a matter of fact, I just added it to the evergrowing todo list again"
I'm guessing and hoping the back will have the Larian Studios logo. Currently the engine supports up to 6 players. LAN is peer to peer; AFAIK Steamworks requires being logged into Steam to be able to connect to a friend hosting a game; the (not officially confirmed) non-Steamworks solution for online play has not been described in any detail yet (that I've seen). I don't know what kind of licensing is used for the editor, but Larian has said people would be able to charge for mods. Swen is wearing a weresheep t-shirt in the update #17 video (with a close-up), though doesn't show the back (didn't check the videos LC mentioned). It looks like the weresheep logo below, but with a white background, on a white t-shirt. The beta testing will be used to get feedback, etc, but you don't need to go out of your way to look for issues if you just want to be able to play it a little earlier (in an unfinished state, with changes and balancing possible before release). If you add an extra $666 to your pledge it will be charged. If it was a joke it wouldn't be in the list of add-ons, since kickstarter / Amazon would have no way to determine how much of a pledge is 'real' and how much you didn't really mean. Yes, alpha access includes beta access; that just isn't mentioned on the main page. The DD add-on is the current Steam / GOG / Larian Vault digital download version of the game. Eh, me and my typos. I meant *scared. Anyway, Larian, the way you choose to do work is really inspiring. You've got yourself a lifelong fan with what you've done here so far. Stay amazing (no pressure :3)! @Tomba: that reminds me, Larian deserve a pool next to their offices. You know, something inside, where it's always warm, so they can brainstorm, relax & drool over the only female co-worker (before she gets scarred and runs away). They should totally make a KS for that. I'd pledge. You are horrible people! Just giving people the ability to make cool games FOR FREE!!??! What are you, COMMUNISTS?! Do you realize there are many CEO's, marketeers and lawyers at publishers that just have ONE sports car, and not even a convertible one? And I've heard they don't even have a pool at their beach house! You people are everything that is destroying the games BUSINESS! Fellow gamers, if we don't act now, creating games might become fun again, like it was 20 years ago, and who wants that? 1. Can I get a t-shirt (weresheep) if I chose a digital tier? 2. Divine Divinity HD... It's not the one currently available on Steam and similar services, right?It's an actual High-Definition update? The last couple days you should have been above camelot unchained on Kicktraq if their top ten list made any sense. 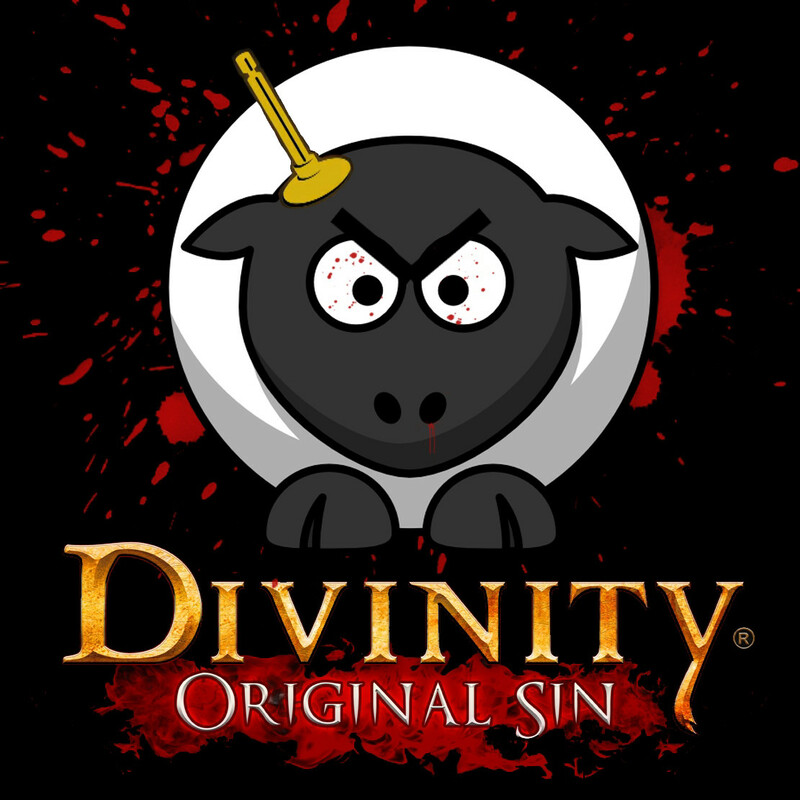 Having played Divine Divinity and Beyond Divinity way, way back in early 2003-2005 and enjoying them, I am happy to back Original Sin. Looking fwd to Original Sin! I am really happy that Kirill gets to have a symphonic orchestra! All the music I have heard from this game so far (in your videos or the music at the end of TotalBiscuit video) sound awesome! @Jon Stump, Divine Divinity Digital Version is a different game! Here is some news from France, a vidéo and opinion of the most famous site about video games in the country : www.jeuxvideo.com . The title speaks for himself :'Divinity Original sin' Best RPG of the year ? So what does the $5 HD add on do? Is the game not HD to begin with? In the Reddit AMA Swen mentioned about potentially adding the Weresheep T-shirt addon to the digital KS tiers. Is this going to happen? I so want that weresheep tee but I'm on a digital tier. Or any chance we can buy that in the Larian store later on? Oh and great music at the end! Awesome campaign, you are doing a great job! But i´ve one question: In update #20 you wrote "Alpha Access for Divinity Original Sin: add $50 (includes beta access)" - this addition is missing in this update and on the main page - so includes alpha access also access to beta? @larian: wish you'll reach the companion stretch goal, guys! That being said (and I know I'm a little obsessed about that), I would gladly swap all the stretch goals reached till now (as well as the "mega-dungeon) for the npc scheduling. Don't get me wrong, guys: all your stretch goals are wonderful addition to the game, and I know NPC scheduling doesn't come cheap, but it was such a big part of Ultima VII that I can't simply imagine a "spiritual successor" without it. Maybe you should open a poll like that: dead backers, do you prefer a game with a shelter, PC traits, orchestra and companions, OR a game with npc scheduling? Congrats on the 700k goal! Just uped my pledge 5 $ just to get div HD! Kirill must be a lot happy for all strangers donating to him just so he could get an orchestra, the man worth it. Also thanks for the free soundtrack, it was all I wanded! @Francois: "So now I'm quite curious as to how the Weresheep T-Shirt will exactly look like. (will there be a back print?...)" @Dwelfusius: "DD in new engine < 3 So much love.. and female t's ^^ jeeeuj"
Question. ◾THE Hint concerning the Weresheep: add $666, Is the money actually taken out? 1) Is beta access add-on expected to be used as beta-testing or just for us to see and get the game a bit earlier ? 2) Did you considered adding also Beyond Divinity Digital Version (HD) 5$? So now I'm quite curious as to how the Weresheep T-Shirt will exactly look like. Will a preview, similar to the D:OS T-Shirt, be added to the page? Loved seeing DD remade please please please have the area in divinty sin just so that us old timers can go nostalgic on revisiting the village. Also quick ? on customization of characters can you change your characters appearance such as hair color face etc. All the final designs are final, each one evolved from one of the original ones (different monster subtypes). Or that's how I understand it, at least. Editor looks fantastic. It would be great if you integrate some good functions for mods translation. Like export names, dialogues from mod to .txt and then import it back. Good Luck and thanks for great RPGs. Also, please consider putting the bullet points of what Swen said in the video as text in the update, if that's still possible ... imporant info shouldn't be hidden in a video IMHO (can't watch videos at work; search engines can't really see their content either).